Derelict and abandoned 370 Jay Street, owned by the City and leased by the MTA, has been called a "blight on the neighborhood" and worse. 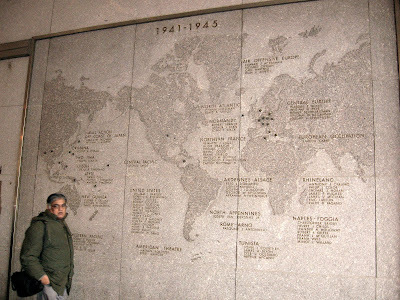 But we are not here today to curse the 13-story Downtown Brooklyn building, but rather to admire the relief map highlighting WWII theaters of action, located on a wall facing Jay Street, near the dismal stairs that go down into the subway. Very few of the hundreds who hustle by every day ever look at this map. One woman told me she worked in the building for years but never saw it. "What is it?" she asked. Once she learned it commemorated WWII, she wanted to get her own camera and take a photo of it. The parish office of the Oratory Church of St. Boniface at 111 Willoughby Street in Downtown Brooklyn has some interesting sign action going on above the office door. 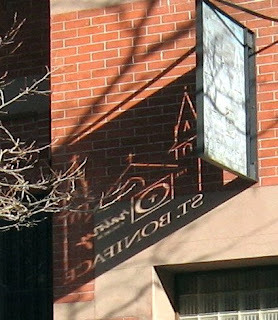 The early-morning sun shines from the east through the carved sign, projecting a mirror-image line drawing of the church onto the brick wall. If the evening sun reaches the sign from the west, the letters will project onto the wall to the right, and should read correctly. We received an email last night saying: "Tell Governor Paterson that you're against granting stimulus funds to Atlantic Yards. Help make sure New York's share of the Federal stimulus program gets to projects that really deserve it." As of Wednesday night, there were 412 signatures. UPDATE: As of Thursday noon, it was up to 1035 signatures. Dozens of government agencies, not-for-profits, unions and green collar job training programs – and even the New York Mets – will be on hand at a job readiness fair to recruit individuals for their various programs, as well as to assist job seekers with resume preparation and other job readiness activities. The aim is to prepare individuals for employment and start a Southeast Queens database of registered job seekers in order to take advantage of Mayor Bloomberg’s and President Obama’s employment, public works, infrastructure spending programs. Speaking of job fairs, we thought you'd enjoy this WWII-era video of women being trained for the world of work when men joined the armed forces, posted on flickr by Bobster1985. It's an excerpt from 'Campus on the March', a film made by the government. The women were expected to give the jobs back when the men returned. We always see interesting knick knacks in the windows at Timeless Treasures, the large Christian gift and bookstore at 163 Livingston Street (between Gallatin Place and Smith Street) in Downtown Brooklyn. 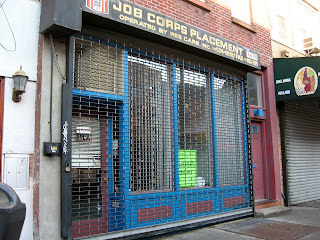 But we were surprised to find the store shut and the windows papered yesterday. There are no signs saying what's happening, and their voice mail is too full to take messages. The store's website says they have 5,000 square feet on two floors. Wonder what's coming in next? 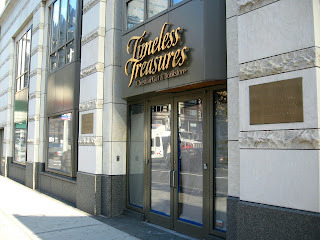 UPDATE: An email from Timeless Treasures says only: "We are sorry to let you know the store has closed. Please continue to shop at the Timeless Treasures website." Another accident recently happened on Adams Street in Downtown Brooklyn. This time no one was killed, though one person was injured. The Brooklyn Eagle reports that a car and a bus smashed into each other at the corner of Adams and Fulton around 8 p.m. Monday night, knocking a passenger inside the car unconscious. No word yet on the state of the passenger. According to CrashStat, there were 49+ crashes at this intersection between 1995 - 2005, and dozens at adjoining intersections. And it's a half block south of where a Brooklyn Heights' woman was killed last April, at Adams near the Marriott. This is less than a block away from where Judge Bookson was struck and killed, and two blocks away from another deadly intersection, Adams and Tillary Streets. Teacher Ron Mortensen was killed at this intersection in April 2007. The Dept. of Transportation has temporarily changed the traffic patterns at the intersection of Adams and Tillary Streets, in an attempt to make this particular intersection safer. Every time parents hear that another accident took place on Adams Street, they speed dial their kids. Many schools -- including the Urban Assembly School for Law and Justice high school, the Urban Assembly Institute of Math and Science, Brooklyn Friends School, Brooklyn Law School, City Tech and Polytechnic University -- lie within a three-block radius. St. Joseph High School is just down Willoughby Street. Pacific High School is on Schermerhorn Street at Adams. Hundreds, if not thousands of children have to cross Adams Street every day to get to class. 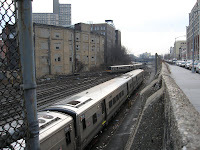 In 2006 there was a drive to create an Adams Street/ Fulton Street overhead pedestrian overpass. At that time a local mom was quoted as saying, “An upper-schooler was hit in September, 2005; two middle-schoolers were hit in April 2005 and January 2006; and [our school's] head of Security was hit on May 1." The overpass idea never got anywhere. UPDATE: The GreenBeatBrooklyn blog reports that 39 percent of drivers in NYC have been clocked as speeding -- and Brooklyn has the worst record. 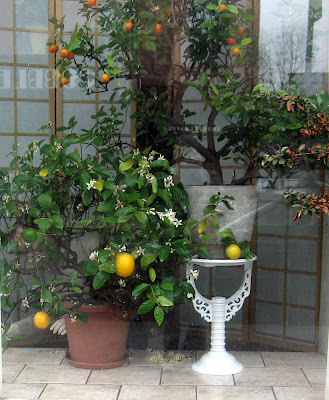 For years and years, we have admired the well-tended oranges and other citrus growing in a window on Court Street in Cobble Hill, Brooklyn. The trees produce a bounty of tropical fruit every winter -- citrus season in Florida. When we were younger we skipped by the trees. Later we walked by them. Season after season, we wondered whose trees they were and who kept them so well. Yesterday, when passing by, we saw some movement near the base of the pots. There were two white-gloved hands sweeping up a bit of orange-blossom debris. We took a photo, and found when we got home that we could just make out a bit of the long-admired citrus tender behind the tree on the left. Citrus Man, we salute you. Brooklyn's Atlantic Avenue Tunnel -- What's Behind the Wall? 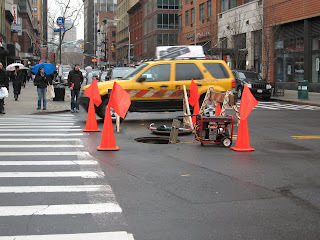 Bob Diamond's famous Atlantic Avenue Tunnel tour took place again Sunday (the open manhole cover at Atlantic and Court Streets is the only outward sign of all the activity taking place in the tunnel under the street). Diamond is now trying to get permission and funds knock down a wall at the west end of the tunnel. He thinks there may be a perfectly preserved locomotive from the 1800s behind the wall -- or even the missing pages of Booth's diary that list the conspirators involved in Lincoln's death. 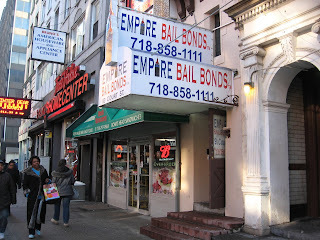 "The Right Bail Bond Takes an Empire" is the motto of Empire Bail Bonds at 93 Court Street in Downtown Brooklyn, conveniently located near Bruno's and just one block up from Brooklyn Criminal Court. Make sure to bring collateral. Its current home at 109 Montague St. in Brooklyn Heights recently sold for a remarkable $3.7 million, so Heights Books is moving to this location near Dean St. on Smith (next to Ki Sushi). 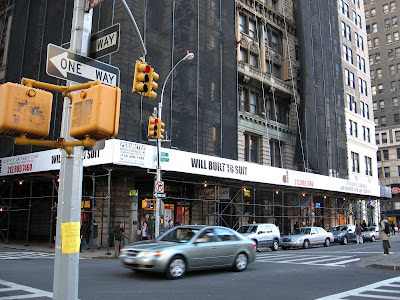 According to the Brooklyn Eagle, the book store will be making the move in March. The buyer of 109 Montague wanted the property with a vacant retail space, according to the Eagle: "This is because of his own plans to get involved with a new business in a joint venture — possibly a food store, definitely something different from what’s on Montague Street already." Earlier this month, McBrooklyn reported about the weird grammar on the Joseph P. Day sign running around the 13-story Temple Bar Building, at 44 Court Street (and Joralemon) in Brooklyn Heights. 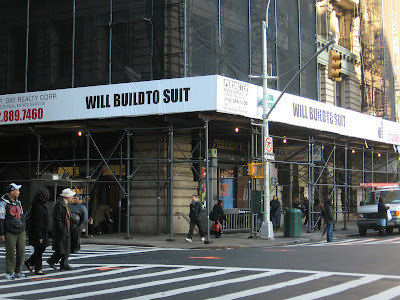 It read "Will Built To Suit." We're happy to report that the Grammar Gods have spoken. When we passed by the building this morning, we saw that the sign had been changed: "built" has become "build." Walk in peace, children. All is well, grammatically speaking, on the streets of Brooklyn. Brooklyn's Temple Bar Building 'Will Built to Suit'? 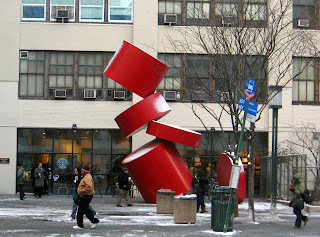 Now that the scaffolding that surrounded this Polytechnic University building for years has finally come down, Paul Sisko’s red sculpture “Balanced Cylinders" in front of Starbucks at MetroTech can be seen to its full effect. 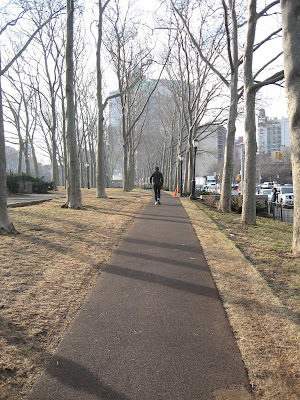 Cadman Plaza Park, Brooklyn, 8 a.m.
Who says there's no peace in Brooklyn? 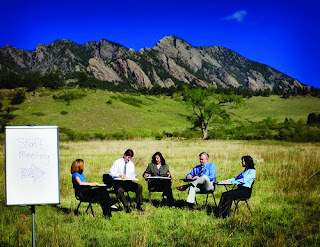 Thinking about starting a Green business? A Green Entrepreneur workshop takes place tonight -- Wednesday, February 18 -- from 7 - 8:30 p.m. at Green Spaces, 33 Flatbush Ave., Brooklyn. The workshop features Ronald Tramozza, Partner, Citrin Cooperman. Entrepreneurs will have an opportunity to learn some simple strategies for setting up a business and avoiding unnecessary tax consequences. Networking and mingling after at Green Spaces. RSVP: Space is limited. $15 to register. See Green Spaces website, search "events." 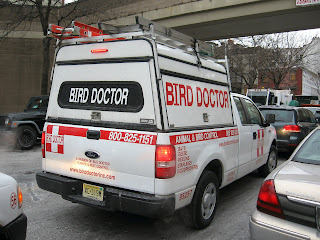 You don't have to know how to fix birds to be a Bird Doctor. Bird Doctor specializes in getting rid of pest bird species, not curing them. Pest birds are, according to their website: "Canadian Geese (11 varieties), feral pigeons, starlings, woodpeckers, turkey vultures, crows, grackles, sea gulls and house sparrows." Best of all, they're hiring: Bird Doctor is seeking "salespeople, bird technicians and office personnel." We say, go for it. 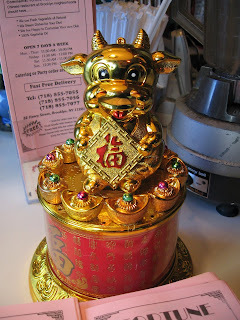 Fortune House Restaurant, on Henry Street in Brooklyn Heights, has a new candy jar commemorating the Chinese Year of the Ox. Considering today's economic situation, it's fortunate that the Ox is characterized by people who "labor through their daily responsibilities either at work or at home without complaint or gripe," according to Wikipedia. "Oxen know they will succeed through hard work and sustained effort and find no truth or benefit in concocting get-rich-quick schemes." Perhaps appropriately, considering the awful year we just left behind -- the Year of the Rat -- Wikipedia characterizes Rat-folk this way: "Behind the smiles and charm, a strong sense of entitlement lurks deep within these people, and to go along with that, Rats can be arrogant and extremely deceptive and selfish." 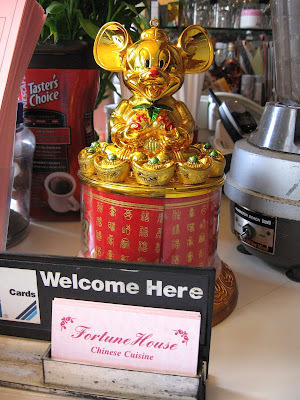 Goodbye and good riddance, Year of the Rat! It's up to the Oxen now to clean up your mess! iStoreGreen at 12 Hall Street near the Brooklyn Navy Yard (it used to be called Hall Street Storage) is a "green" self-storage business. It offers biodegradable packing peanuts, reused packing boxes, a room to place discarded items that are given to a local charity instead of dumped, a solar water heater, etc. Now we've received an email saying that this spring, they plan on rolling out a fleet of pedi vans for moving local customers' things into self-storage using "bicycle power and zero emissions." We're looking forward to seeing these babies cruising the streets of Brownstone Brooklyn. Owner Jeffrey Sitt hopes to create iStoreGreen franchises across the country, according to the Brooklyn Eagle. 'Swank' Restaurant on Montague Street, Brooklyn, In the 40s? Al Salerno was a columnist for The Brooklyn Eagle in the late 1940s. In his “Night Life” column in 1948 he wrote of a restaurant named Le Cordon Rouge, but never mentioned the street address on Montague. It was a swank restaurant, but the paper hasn't been able to determine the exact location. Does anyone know? Salerno describes the restaurant as having a chef from Sardi’s, an old and famous bar "from the once-fabulous Reisenweber’s," a coat room, "an old-fashioned fireplace topped by crystal lamps, a luxurious timepiece, and further up, miniature balconies"
The only location we can think of that could hold all of that is the present site of Hallmark Cards on Montague. What are we overlooking? More on Le Cordon Rouge here. Why Do People Staple Signs Onto Trees? 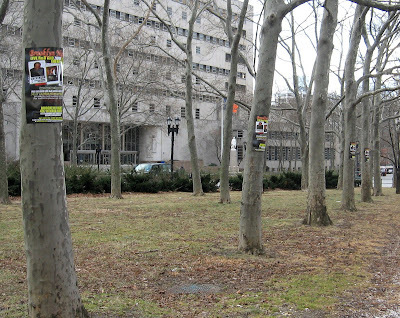 These "Brooklyn Nights" posters were stapled onto the trees in Columbus Park in Downtown Brooklyn for a couple of days before we had the chance to tear them down. Unfortunately, the staples are still stuck into the wood. 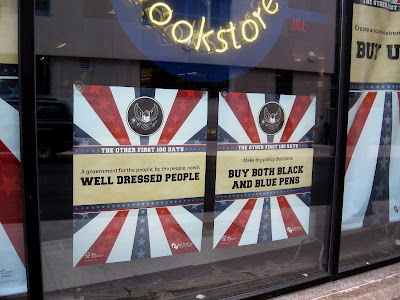 According to the City Tech bookstore in Downtown Brooklyn, the government needs well dressed people. And well dressed people need black and blue pens . . . Downtown Brooklyn subway riders were surprised this morning to find that the decrepit MTA building and its plaza on Jay Street in Downtown Brooklyn were transformed into the set of Jack Goes Boating, Bob Glaudini’s Off Broadway play which was first produced by the LAByrinth Theater Company in 2007. Original cast members Philip Seymour Hoffman, Daphne Rubin-Vega and John Ortiz will appear in the film, which is also being directed by Hoffman. According to Broadway.com, Jack Goes Boating is a "quirky romantic comedy about two misfits navigating the joy, distractions and pitfalls of New York City." While this is Hoffman’s first directorial attempt, this is not his first time producing. His company, Cooper’s Town, produced Capote -- the film that helped him earn his first Oscar, according to TheScorecardReview. 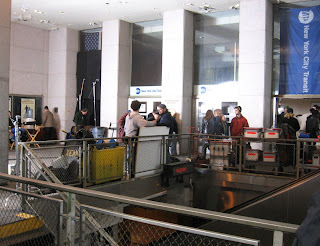 Filming is also taking place "on the third floor of a courthouse near Montage Street," a crew member told McBrooklyn. 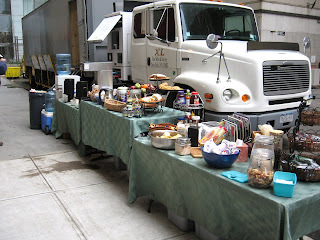 Breakfast was set up in a cul-de-sac behind the MTA building. New York vs Bed Bugs sent word that the New York City Council will hold a hearing on three bed bug bills on Tuesday, February 24 at 1 p.m.
--Intro 873, a bed bug education bill that would create a training program for property owners and pest control operators at the Department of Health and Mental Hygiene, and a bed bug hotline. NYvBB says, "Come to the hearing to show your support and/or to testify. Tell the New York City Council that bed bugs are a threat to the quality of life and health and happiness of all New Yorkers. No advance registration is necessary to testify in person, but the committee counsel would appreciate a heads up (via email). People can just show up and sign in with the Sergeant-at-Arms. In general, 2-3 minutes are allowed for testimony." 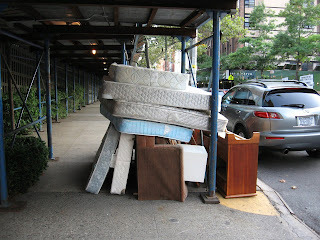 New York vs Bed Bugs is tracking developments here. - Someone leaked renderings of The Hook, a 376,00-square-foot mega-mall on the site of the old Revere Sugar Refinery site in Red Hook, to Brownstoner. Here's a closeup of the ground level at the 40-story Oro Condos, 306 Gold Street in Downtown Brooklyn. According to Street Easy, there have been 157 sales and 3 rentals; currently there are 12 active sales listings and 62 in contract, plus 5 more rentals listed. A 1-bedroom, 1 bath on the 25th floor sold for $610,000. The same line on the 5th floor went for $461,000. A 2-bedroom on the 39th floor is in contract for $1,135,000. About 16 units have been taken off the market. You can rent a 1-bedroom for about $2,500/mo. According to the Brooklyn Eagle, Prudential Douglas Elliman’s Developments Group, responsible for sales at the Oro, hired a "move-in coordinator" to assist new homeowners with the move-in process. 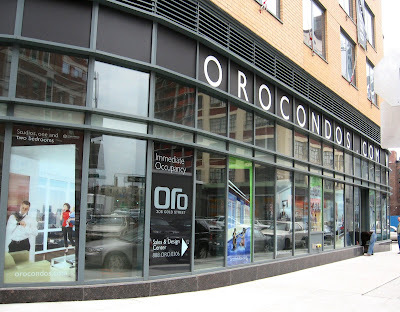 - Oro Condo, Downtown Brooklyn, More Than 50 Percent (Sort of) Sold? We didn't really pay attention to the release of the upcoming Kindle 2 from Amazon until we saw a video of the very sleek ( 1/3" thick) ebook reader. Yesterday Amazon sent us an email saying Kindle 2 is available for pre-order for $359 now. It will be released Feb. 24. Features: The new Kindle 2 is much thinner and sleeker (think iPhon-ish) than the original. The 3G wireless lets you download books, newspapers, blogs etc. directly to your Kindle. It uses free "Whispersync" cellular radio from Sprint, so there are no Wi-Fi hotspots or computer needed. It takes 60 seconds to download a book; the charge holds for days or maybe weeks. Kindle 2 can read everything out loud -- for when you're driving; or at night in bed, it can read to you like mom used to (assuming your mother was a droid). According to Computerworld, some owners of the original Kindle said the 2GB of storage offered in the Kindle 2 won't be enough. But a Kindle 2 spokesperson told them, "That's room for 1,500 books," and that any book a Kindle user buys is backed up on Amazon's servers. Techcrunch says the 2 has more than seven times the storage of the first Kindle. PC Magazine lists 10 things you should know, both good and bad (bad: there's no color; good: it's not going to kill books, just make it easier to buy more of them). A Canadian company, Shortcovers, on the other hand, will soon be launching an app for the iPhone, the BlackBerry, and Android operating system that will let you read book chapters on your smartphone. Not as much razzle-dazzle (and harder on the eyes) but cheaper, at least initially. Trader Joe's is another retailer that seems to be coasting through the recession. 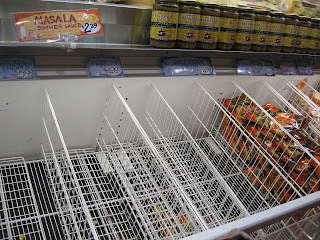 The frozen food coolers were half wiped out Sunday about 5 p.m.
We were there to load up on crab cakes and vegetable gyoza, both gone. 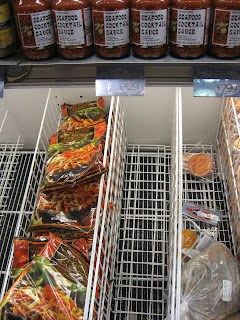 Shrimp and chicken stir-fry, chicken tempora, various vegetable blends and deli items were also out. Workers were refilling other bins, so perhaps they just didn't have time to refill these items. The lines, as usual, wrapped around the store, but they do move quickly. - After Gristedes and Trader Joe's, What's Next for Downtown Brooklyn? No, not really. 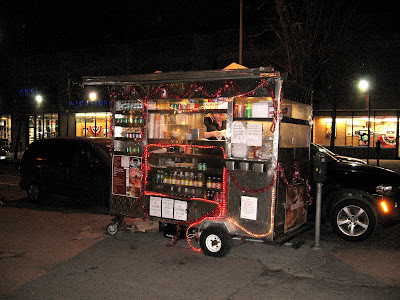 But when we came out of the St. George subway station last night and saw this gaily colored food cart on Henry Street, it put us in mind of a Gypsy wagon. So we visited Wikipedia to see what Gypsy wagons really looked like. It seems that Gypsy wagons can be beautiful, like this Reading style of traditional Romanichal "Vardo" (wagon), built in the late 19th Century. According to Wikipedia, the wagons "are prized for their practicality as well as aesthetic design and beauty. " No resemblance to the food cart above. Our apologies, Romani. Photo courtesy of Wikipedia's Vardo entry, Creative Commons license. You Know Christmas Is Really Over When . . . 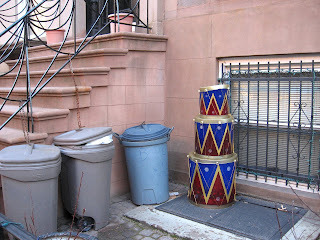 The drums are always the last to go. Clinton Street in Cobble Hill, Brooklyn. "It has come to our attention that there is a great deal of value in the furniture that is no longer needed from the office of a former CEO. We have decided to put it up for sale. There are quite a few items and we would be willing to sell as a set or separately. Price is not negotiable. The buyer must be willing to come in the middle of the night for haul away as we do not want any additional people to see it than necessary. 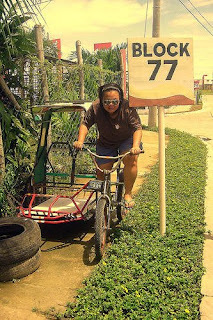 If needed a driver can be provided for an extra charge. The buyer must also sign a non-disclosure agreement saying they will not sell pictures to the press or speak to anyone about where the furniture was acquired or how much was paid." The items include an antique area rug; a George IV desk, rarely used; an off-white parchment waste can "perfect for shredded documents," and more. 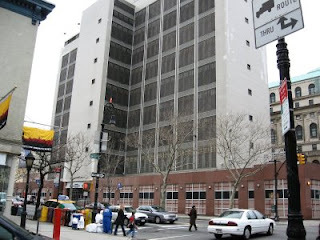 Blaming "ballooning costs and lack of documentation," New York City Comptroller William C. Thompson, Jr., announced late Thursday the rejection of a contract submitted by the Department of Design and Construction (DDC) for construction-related services at the Brooklyn House of Detention. In a letter, the Comptroller’s Office cites problems that include the failure to adequately explain an almost 100 percent increase from the original estimate in construction costs for the project and incomplete documentation provided to his office. The initial total projected cost was $222,000,000. But, according to the Comptroller's office, "due to DOC’s failure to consider site constraints, subsurface conditions, pile foundations and other complexity factors," the cost was upped to $420,000,000. This doesn't mean that the plan to rebuilt a bigger and better House of Detention is killed forever. Thompson, who is running for mayor and who is also a plaintiff in the court case against the re-opening of the Brooklyn House of Detention, has advised DDC, in the event they would like to resubmit this contract for review, to provide his office with "all necessary documentation." UPDATE: In related news, a verdict is expected to be released within a week for the lawsuit filed to halt the renovation of the jail. According to the Brooklyn Eagle, Justice Sylvia Hinds-Radix said that she will release her decision by Feb. 11. The Most Fascinating Story Tellers in Brooklyn Heights? Auction Party and Raffle 6 - 8 p.m.
Silent Auction art on view and open for bidding in the gallery and online from February 14 through February 21, 2009, concluding at 8 p.m.
Robert Levine of RAL Development Services, who had offered space for a middle school at One Brooklyn Bridge Park on the waterfront in Brooklyn Heights, has withdrawn the offer, according to the Brooklyn Eagle. Levine said that "a school is not allowed within the approved General Project Plan" for Brooklyn Bridge Park. 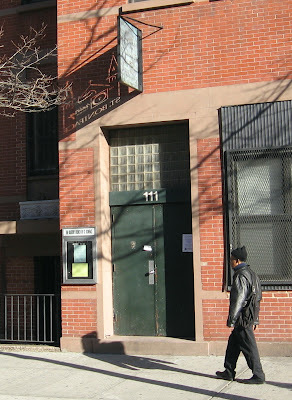 The Eagle had reported RAL’s offer following a public hearing before the Borough President on the Dock Street Dumbo project last week when a speaker indicated that several other locations for a middle school were available. Odd how more than a thousand residential units could be approved for the park, but not a school. - Is 1 Brooklyn Bridge Park Dead in the Water? Brooklyn Friends’ 14th annual African American Celebration will take place on Friday, Feb. 6 at 6 p.m. in the school. This year’s theme, “Crossroads of History: The Improbable Journey,” celebrates the historic election of Barack Obama as our nation’s 44th president. Equally important, the school is paying homage to the legions of community activists and orators that paved the well-worn path that made Obama’s election possible. In that spirit, the program will focus on words — speeches, stories, songs — that have inspired citizens to create change. The evening begins with a buffet supper in the cafeteria, and continues with a performance in the meeting house. New this year is a special program for preschool and younger lower school children in the lower gym with artists and a professional storyteller. A guest gospel choir will take part in the performance. Brooklyn Friends School is located at 375 Pearl St., one block from Borough Hall in Downtown Brooklyn, just around the corner from the Marriott Hotel. For more information, visit www.brooklynfriends.org/aac. Joseph Ades, the man who could sell anything -- but especially vegetable peelers -- died Sunday at the age of 75. Born in England but with a voice that recalled Australia, Joseph Ades was a legend in New York City. He was featured in the Daily News, Vanity Fair and other publications which he displayed next to the little table where he sold vegetable peelers. The peelers flew out of his hands like magic. The New York Times wrote a fitting obituary of this man who appeared to be many things to many people -- "The white-haired man with the British accent, the expensive European suits and shirts — the man selling the $5 peeler. For carrots. Or potatoes." Gawker picked him as one of the grand eccentrics of New York; The New York Press said, "No finer peddler exists in New York." 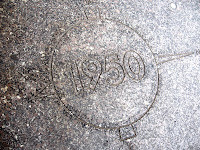 Joseph Ades was a regular on Court Street in Downtown Brooklyn, and in front of the fountain at Brooklyn Borough Hall during the farmer's market. McBrooklyn shot the above video of this amazing salesman at work on Court Street in July of 2007. Now we wish we had one of the peelers. We just thought he'd always be there. 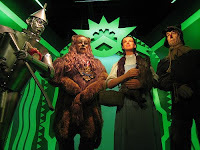 Travel over the rainbow and continue your performing arts education alongside a professional cast in the National Tour of The Wizard of Oz. * We are looking for 2 groups of 12 kids from different existing dance, choir or theater groups to play munchkins during The Wizard of Oz in New York City from March 26 – April 5, 2009! * Auditioning groups must have 12 kids that meet the requirement. Registration closes 48 hours prior to audition. Auditioning Groups must consist of 12 children between the ages of 8 and 13 years old. Registration is limited to 15 groups. * Due to wardrobe specifications auditioning kids must not exceed 5 feet in height or 100 lbs in weight. No exceptions. * Singing and dancing experience are required, as is ENTHUSIASM! According to a story reported today on NPR's All Things Considered, an increasing number of alleged victims are coming forward in a scandal involving the sexual abuse of minors in Brooklyn's Hasidic Jewish community. Two alleged victims who were raised as Hasidic Jews -- after years of silence -- tell NPR's Barbara Bradley Hagerty about the sexual abuse they endured as children. Though "only" four ultra-Orthodox rabbis in Brooklyn have been sued or arrested for abusing boys in the past three years, "That's a tiny fraction of the actual abuse, says Hella Winston, author of Unchosen: The Hidden Lives of Hasidic Rebels. . . . the community is so insulated and the rabbis are so powerful that few dare to come forward." Last August, politician and radio talk show host Dov Hikind, who is Orthodox himself, devoted an hourlong program to sexual abuse. The calls flooded in. "Fifty, 60, 70 people," he says, "but you got to remember for each person who comes forward, God only knows how many people are not coming forward." Hikind is working with the district attorney's office. One rabbi says, "It's being blown out of proportion, big time." Something about the 13-story Temple Bar Building, at 44 Court Street (and Joralemon) in Brooklyn Heights, caught our eye yesterday. Not the scaffolding, and not the fact that the Joseph P. Day Realty Corp. was offering multiple units in the 1901 building, known as "Brooklyn's first skyscraper." What caught our eye was the unusual grammar on the Joseph P. Day sign running around the building: "Will Built To Suit." This was repeated several times around the building. This appears to be a grammar malfunction to us here at McBrooklyn. A survey of Google, however, finds more than 1000 uses of this same phrase. Where the heck did this come from? The correct usage, "Will Build To Suit," was cited by Google more than 73,000 times. A post in Education Week asking "Why can't kids spell today?" blames this exact phrase as being partially responsible for today's creeping illiteracy. 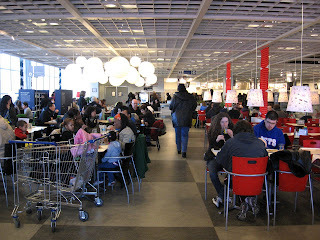 If Saturday's crowd was any indication, the sour economy hasn't hurt Brooklyn's IKEA all that much. In spite of the bus and ferry cutbacks, customers were rumbling through Red Hook's big box like a herd of buffalo. The checkout lines were quite manageable, however. Our wait was about 15 minutes, on the short side for IKEA. Sales at the privately-held company rose 7 percent in its latest financial year, according to Reuters, though its top executive was quoted as saying "the global economic slowdown is weighing on the retailer."